New for May 2008! Here we'll show an example of using the Lim-Eom splitter to form a three-way divider/combiner network, such as you might use to combine the output signals of three power amplifiers. Someone recently who asked us for advice on this. It is not going to be an easy design to pull off for a few reasons having to do with laying it out, which we'll explain. Let's start with the basic circuit, in this case we have a physical layout using 15 mil microstrip (381 um) on a substrate with ER=10.2. We'll treat port 1 (on the left) as the input, the other port numbers are in order as you go clockwise around the circuit. Note the two isolation terminations R1 and R2 which are 50 ohms because that is the system impedance. Here's the magnitude and phase of the three splits, looking good. 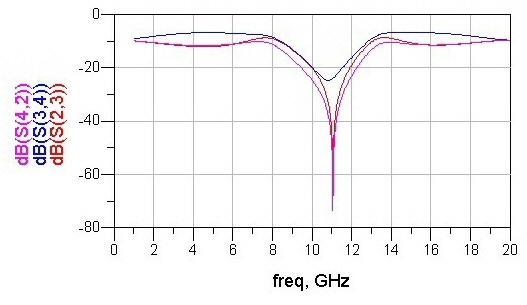 The ideal split for a three-way is -4.77 dB (equal to 10*log(1/3)). The three phase angles are all 90 degrees apart. Here's the isolation between the output ports, all is well. We didn't spend any time trying to optimize this circuit or adjusting it to compensate for the effects of the tee junctions which we ignored. So, which ports do you connect together when you use a pair of Lim-Eom splitters to form a divider/combiner network? Input coupler's port 4 is connected to output coupler's port 3. Input coupler's port 3 is connected to output coupler's port 4. Input coupler's port 2 is connected to output coupler's port 2. 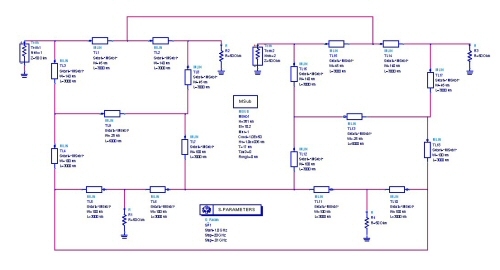 The rule that you must apply is this: the most negative phase port on the input coupler is connected to the positive phase on the output, and vice versa. The "middle phase port" on both splitters is connected. In this manner all of the ports are phase up to the same angle. Here's the response of the back-to back pair. Sweet! 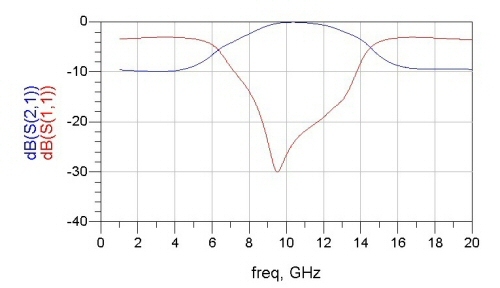 A word of advice that should be obvious to most microwave engineers, but we don't want to assume that everyone knows everything... the transmission lines that connect to the three amplifiers must all be the same length, on the input side as well as the output side, our you will destroy the magical properties of the network. However, you could experiment with adding half wavelength lines to some of the connections that need to be longer. The Lim-Eom power combiner is not going to be an easy planar layout because of this little detail. Our advice is to add equal-length meandered lines to all of the ports and bend and twist them until the land where you want them to. But wait, there's an even bigger problem... the output port is trapped inside the network (look at the schematic above and check out where port 2 is located). It looks like there's no way to connect the circuit without resorting to jumping over the network with a wirebond or an airbridge... or is there? 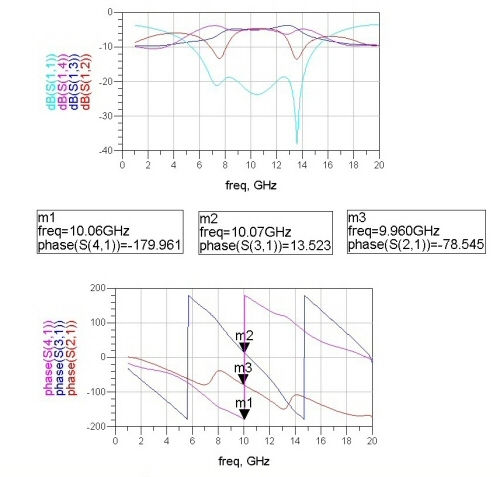 If we could use the network in a 3 dimensional (non-planar) layout, with the two splitters occupying separate stripline boards, the two splitters could be folded back to back and the amplifiers coukld be inserted as orthogonal connections to the splitters with essentially zero length interconnects. 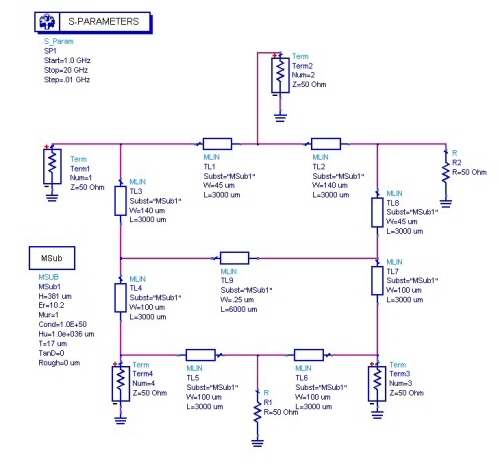 If anyone has a layout of a successful Lim-Eom divider/combiner network, please send us an image!